"Baby it's cold outside" this tune of a winter song comes to mind when thinking of January in the Alps. 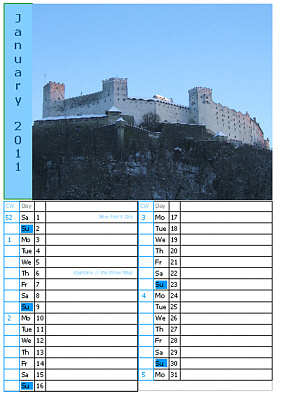 On one of those rare days where the winter sun was greeting us we took a photo of one of the most photographed buildings in Salzburg - the fortress of Salzburg "Hohen Salzburg". And those who have visited MiaDeRoca before will have recognized the image, you can see it on the top left of this very website - it is the image we use for our MiaDeRoca post cards, yet 6 months later in the year. The trees have long ago lost all their leaves, the white castle looks as cold as a rock can be in winter and the hill it stands on is merely shock frosted. Winter in Austria. But we love the light blue of the sky, greeting us early in the morning (8 am it was), maybe the winter sun will climb a little higher, but probably the cold fog will eat the whole city up again. Winter is cold and nasty, but I love it. I love the snow that covers everything, and forces us all to plan time very well, slow down our pace and have in mind that sunlight is a rare but highly precious guest during a winter day. Bear in mind that winter is full of fun, laughter and joy - the preparation of the big family celebrations Christmas, the welcoming of the new year in January, the party for lovers on Valentine's Day and then there is carnival. There is nothing better than getting into the warmth after a long day out - be it for walking in the snow, skiing, sledging (or using the tobogan), or watching your kids building a snowman, snowoman, snowdog and whatever you can create with this great white none lasting material. In winter you have time to remember and you have time to think of the going last year and plan the brand new year - and you have this promise that there will be spring again, which will be followed by summer and by autumn. You can think of the growing and blooming (without hay fever), dig deep into the anticipation. Maybe start to plant some seeds. Maybe some tomatoes this year, some chili peppers and physalis. Start to plan where you are going to travel this year, think of the flowers to plant. Did I already mention that I love winter?